The rumors are true! Sprocket Nathan has become New Media Nathan and I’m exceedingly pleased to merge my design studio and join the NMC team. Over the course of 6 years, my small team of designers, illustrators, and programmers focused on branding design and web development for local institutions. I enjoyed every project and am really proud of the work we’ve done for distinguished clients: we count Top of the Hill Restaurant (and Distillery), The Franklin Hotel, The Morehead-Cain Foundation, and the University of North Carolina as some of our favorites. But in recent months I began looking for other opportunities to focus on what I enjoy most about the process of making web sites (spoiler: not insurance paperwork). One trade-off of running a small business is to spend a lot of time doing things other than the actual production of the good or service (This is the subject of Michael Garber's seminal book, The E-Myth, which you should totally read if you want to run a small business). In practice, this meant less writing, sketching, drawing, designing, coding, and more insurance, taxes, payroll, sales, and accounting (though I do quite like sales). Basically, transitioning a freelance gig into a growing small business is a 24/7 job that increasingly leaves little time to creative work. And since I'd long been a fan of the technical excellence and extraordinary web work of NMC when I saw that the company had a few positions open, I reached out to Joel to explore if joining forces might be a good fit. After a few meetings with the partners, we found that it was: my particular background is broad and diverse, which is a good complement to NMC’s deeply extensive web technology expertise. I’m set to bring not only Sprocket House's branding & communications experience to NMC but also our portfolio, active client accounts, and extensive ties to the local community. And since everyone here is talented, hard-working, & thoughtful, I'm confident all the clients I bring will be pleased with their new home. For me, it means I get to focus more on the production work — the writing & designing — and less on the business side, which makes me really happy. For NMC, it means broading its bench and expanding the services it can offer. Perhaps best of all, I save myself a flight of stairs during the morning commute (we’ve both been located in the same building in downtown Carrboro, NMC downstairs, Sprocket House up). How great is that? It’s often simpler and more efficient for our accounts people, design team, and front-end developers to focus individually on their respective tasks. But as NMC expands its services to larger, more complex web and communications projects, closing the gap between content and design becomes much more important: we have to ensure that we deeply understand the client’s business, value, and market in order to develop an effective web site and other digital services as part of an overall communications strategy. The job of an Interaction Designer is to watch over multiple points of interaction: between our agency and the client, between the client and the customer, and between the customer and the product. It involves a little strategic brand thinking, a smattering of clever copy, a bushel of user interface design, and a peck of front-end development. Much of this is what I did for my Sprocket House clients. In contrast to NMC, which serves a high-volume of clients in a more focused way, my team tended to work with fewer clients more broadly. 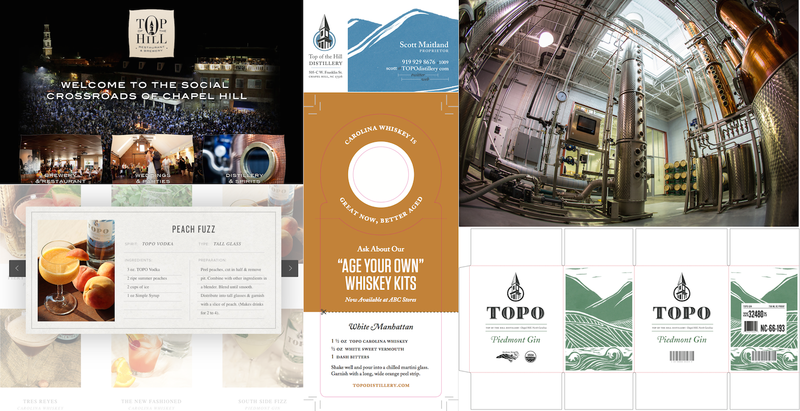 For example, with Top of the Hill Distillery, we not only designed the distillery web site, but also consulted on the brand, wrote advertising copy & named products, designed identity collateral like logos, brochures, stationery, and signage as well as produced specialty projects like a short video and product packaging with hand-drawn illustrations (we made the Age Your Own Whiskey Kit). Did I mention that we also designed the bottles and labels? It’s a real thrill to visit any ABC store in the state and see our work on the shelf. (You can find examples of our work throughout this page.) Now, I get to use that experience to help expand NMC’s service offerings for certain large client projects. Just as the cobbler’s children go shoeless, so it goes with many web firms: who has time to work on the company’s own brand or web site when there’s pressing client work to be done? The NMC crew relaunched its web site earlier this year and it’s a terrific evolution from the previous version. It does a much better job describing the company, its service offerings, and body of work. But as anyone who’s launched a web site (or recorded an album or produced a film or illustrated a magazine) knows, creative work is rarely finished -- often it's what you can ship by the deadline. My task is to round up and dig in to all the great ideas the NMC crew has for making the site best of breed and to show off some of the technical excellence that we bring to every project. I'll be writing case studies and interviewing the partners to articulate better our mission with greater clarity. I get to highlight the unique talents and commitment to cutting-edge web technology and delightful user experience that is the company hallmark, all with the goal of showing why NMC is the best choice to partner with for whatever a client’s digital and branding needs. Basically, the best job ever. The flip side of this coin is the New Media Campaigns brand. Now that the company has grown to 12 full-time staff, launched hundreds of web sites, and been featured in a variety of presitigious publications, we’ve movied from a small, regional company to a mid-sized, national player. With that transition comes some new opportunities to expand the reach of our work and tell the story of the company to new clients and colleagues; that means investing more concerted time cultivating the New Media Campaigns web site and brand. Brands (and web sites) are living things. They need consistent care and attention to flourish! In my short time I’ve been become seriously impressed with the extent of the team’s web production technique and high level of client accounts services. So expect in the coming months to learn more here about these qualities that sets NMC apart. Sprocket House lived most of its life as a small studio of 3 full-timers: me on sales, accounts, user interface design, and branding; a web & graphic designer, and a front-end developer. (For other production tasks, I’d typically just contract photographers, illustrators, print designers, and videographers as needed.) We started life as a web shop but slowly grew to include other design needs our client had -- once we made a web site, we'd be asked also to make sure that the brochure, advertisement, etc. all maintained the same tone and visual treatment as the web site. We just enjoyed enjoyed making stuff and trying out new things, so any time a client would want us to do something, we’d go for it. As a result we did things from designing CD album art for a local band to custom hand-lettered chalk signs for a retail cheese shop to watercolor illustrations of dental procedures to wood-block printed vodka labels to holiday window dioramas to screen-printed fabric tags to short documentary films to software UI & dashboard design to rubber-stamped bottle openers all the way to complete e-commerce and ExpressionEngine web sites with custom add-on development and 3rd-party API integration. Now, I don’t recommend this approach to everyone — let my experience be your guide. There’s certainly something to be said for being a multi-disciplinary design studio. There’s also something to be said for doing a few things really well. Pro: it’s a blast getting to try out a lot of different things. Con: you’re always just at the limit of your ability and therefore can’t always deliver fast (or on time). Ultimately I’ll be narrowing my focus and improving my skills in a smaller number of tasks but love that I get to bring that breadth of experience to NMC. But enough about me! I’m thrilled to be a part of a team like NMC’s and can’t wait to bring my best work and best thinking to the company. In the near term, I’m excited to write more about my experiences here, what the NMC crew really excels at, and the truly enormous amount of new things about business and the web site making process I’m learning. In the long term, I’m likewise excited to be working on complex and rewarding client projects. From now on, the former Sprocket House agency web site will live on simply as my personal portfolio. And if you'd like to chat, please do say hello! Congratulations on merging with the best web team in the country (as far as we are concerned)! We have a few projects to do with Clay and have started on the first one.